I find that there are generally two types of shortbread cookies: thin, crispy ones and thick, buttery ones (A third type of shortbread cookies would be the “bad” ones, but I won’t even get into those – who wants to hear about bad cookies when you can hear about good ones?). I like both and while I am partial to the crispness of the thinner cookies, as long as the shortbread is butter and melts into my mouth when I eat a piece, I know that I’m going to enjoy it. These shortbread cookies are thick, tender and buttery. Aside from the standard flour-butter-sugar-salt base of the cookie, there is also a generous amount of shredded coconut in the shortbread. The coconut not only makes the cookie more tender, but it keeps them tasting fresh and surprisingly moist (by moist, I mean that they are very moist for a shortbread cookie, which tends to be dry; they will not be moist when compared to a cupcake or something of that consistency) long after they are baked. I opted not to add in vanilla or any additional flavorings, but to jazz these up you could blend a bit of rum extract or some lemon zest into the doughÂ before baking. The shortbread dough is very, very crumbly. In fact, it barely comes together when you mix it. The best way to handle it is to simply pour the dough into your baking pan and pat it down into place, rather than try to shape it or roll out the dough in any way. I lined my pan with parchment paper so that it would be easy to remove, but lightly greased aluminum foil will work equally well. The shortbread is so tender that it is necessary to line the pan if you want to avoid crumbling any of the bars. And speaking of crumbling, it is best to cut the shortbread into bars with a very sharp knife when the finished cookies are still hot from the oven. Since the cookies will still be setting up, you’ll get the cleanest bars out this way. I absolute adore these cookies, even though they have a tendency to fall apart if you handle them too roughly and crumbs will probably scatter down onto your shirt when you bite into a piece. It is worth it, especially if you’re a coconut fan. Preheat oven to 350F and line an 8×8-inch baking pan with parchment paper, or with aluminum foil. In a large mixing bowl, or the bowl of an electric mixer, blend flour, sugar and salt together. Mix in butter at low speed until dough is crumbly, but starting to come together. Stir in coconut and continue to mix until dough resembles wet sand; there should be large and fine clumps of dough in the mixing bowl. Pour shortbread dough into prepared pan and press it firmly down into a single, even layer. Score shortbread lightly to make it easier to slice later. Bake for 30-35 minutes, until edges are golden and top is very lightly browned. Middle of shortbread will be set, but not firm. Cool shortbread for 5 minutes, then use a sharp knife to cut the shortbread into 18 bars. Cool shortbread entirely in pan. When cooled, remove shortbread from baking pan and store in an airtight container. Makes 18 large shortbread fingers, or 24 smaller bars. Shall definitely give this a go. Coconuts are available in plenty where we live ( most of us have coconut trees in our gardens, I do)and my husband is a coconut lover. I adore anything coconut, so I will have to try these soon! Another one to try! My list keeps growing…. 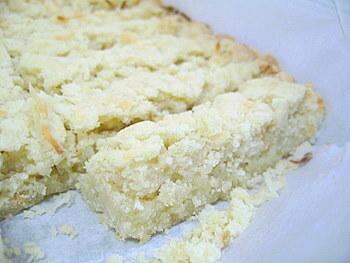 Coconut lover here…and recipe sounds sooo good as I love buttery shortbread, too! and i’m with kate. everything with chocolate, please . . . I do love coconut, so these bars would be a tender morsel right up my alley!! I made these and they are so good. Next time I’m going to dip them in chocolate. Yum! hi nicole! this looks great and easy, i’m ready to try it. have to ask, though, did you use freshly shredded coconut? or will the dry ones that can be bought from asian groceries do? Hi! I know you must have heard this a thousand times, but I LOVE your blog. I just made these coconut shortbread cookies, and they are absolutely wonderful, and so easy to make. Thanks for the recipe!! This shortbread tastes great! I just made it tonight – so easy. I used white whole wheat flour, unsweetened coconut and sugar in the raw (because that’s what I had) and it turned out great. I did go a little heavy on the sugar though because I was afraid it wouldn’t be sweet enough. Thanks for a wonderful recipe! Oh…my God. I just made this and it was incredible. for Christmas. So, dip away!